They protested against the repressive Chinese rule. It was a relief for Buddhists today to receive news of a peaceful rally by Tibetan students to protest repressive Chinese rule. Tendar Tsering has reported for Phayul.com "Students lead mass rally, Hold nightlong prayer vigil." On June 3 and 4, 2012 hundreds of Tibetan school and college students took part in peaceful rally for Tibet in the exile Tibetan headquarters of Dharamshala, India. 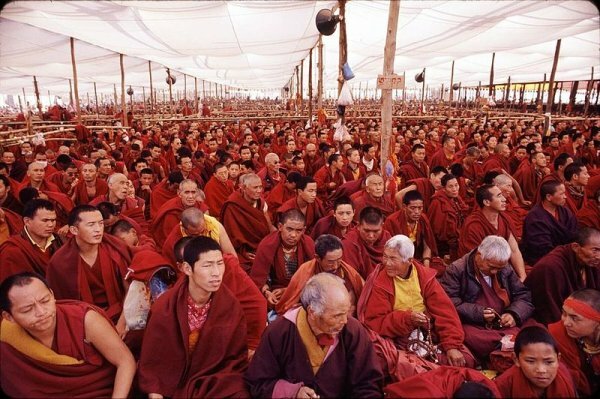 This peaceful rally followed the Dalai Lama’s three-day special teaching for Tibetan youths. The large rally was led by a group of school students from Tibetan Children’s Village School, Suja. Prior to this rally the same group of around 160 students had shaved their heads and sat on a 12-hour hunger fast in solidarity and support with the plight of the people inside Tibet. After the rally the students held a nightlong prayer service at the Tsug-la Khang temple, which is outside the residence of the Dalai Lama. The majority of the children who participated in this series of campaigns, which has been led voluntarily by the students during their summer holidays, are from Tibet. Some of these students are also related to Tibetans who have self-immolated in Tibet demanding the return of the Dalai Lama from exile and freedom in Tibet. There was also a painting exhibition, expressing in art, their first hand experience of living under Chinese occupation and repression, arranged by the school students. It is hoped by fellow Buddhists that this peaceful form of protest without any self- immolations will become more popular for the Tibetans.